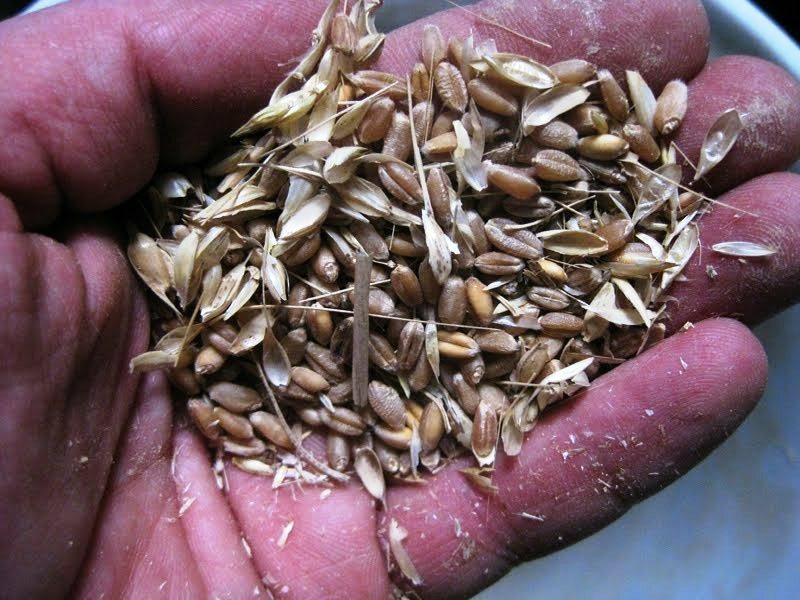 When wheat, barley, or other grains are harvested, the grain must be separated from the rest of the plant before it can be used to make flour. This separation is called threshing. In the agriculture of today, threshing is done with massive machines called combines. As you probably have figured out by now, you can make your own ultra-cheap thresher with a 5 gallon bucket. See the Bucket Thresher in Action! In the following video, Brian Kerkvliet shows off his homemade thresher, made with a drill, a bit of chain, and a bucket. He also shows how he “winnows” the grain with a house fan. This is one design for a bucket grain thresher that will help you dehull your home grown wheat. 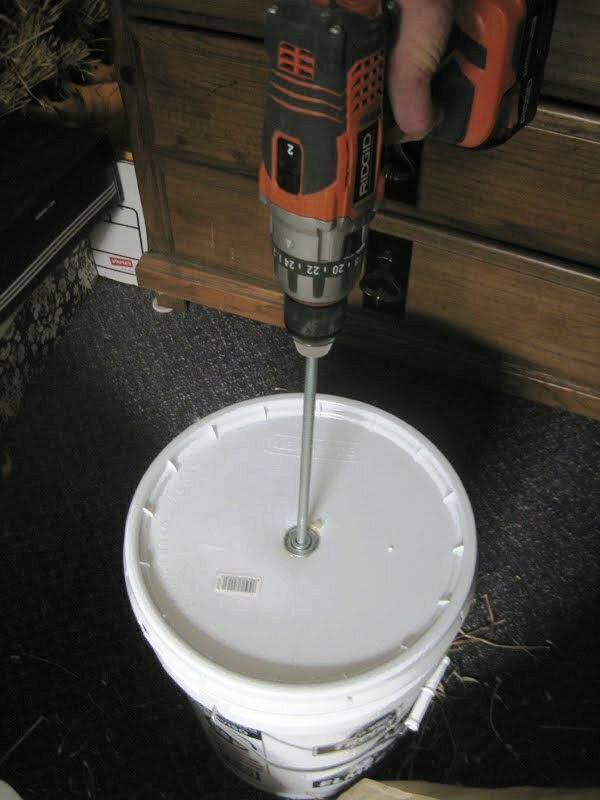 You need the drill twice for this project – first to bore in hole smack dab in the middle of your bucket lid. The hole needs to be larger than your length of all-thread. 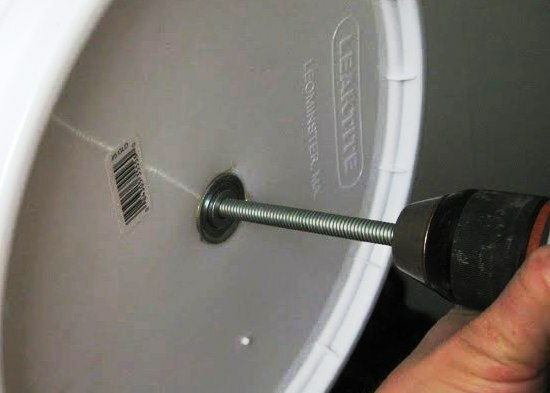 If you glue one of your washers over the hole in your bucket lid, your lid will be protected from being torn up by the swiftly spinning threaded rod. Make sure your length of rod can slip easily through this reinforced hole you’ve created because during threshing, you’ll want to be able to move the drill up and down to get all the grains. On the other end, you want to slip on the rest of your parts in this order: nut, washer, chain, washer, nut. Alright, now you’ve got your threshing tool, and your bucket full of unthreshed grain. 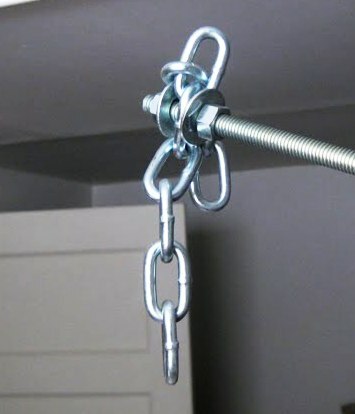 Make sure your all-thread rod is fastened firmly in your drill before you pull the trigger. This has changed my life! I can now process in a day what used to take days, and there is less stress about being thorough enough. I’m suddenly feeling like growing my own grains is not insane. I’ve used this method for 3 years now and can produce two 5 gallon buckets of finished berries in about a weeks work , growing on a 100′ x 100′ plot of dirt . 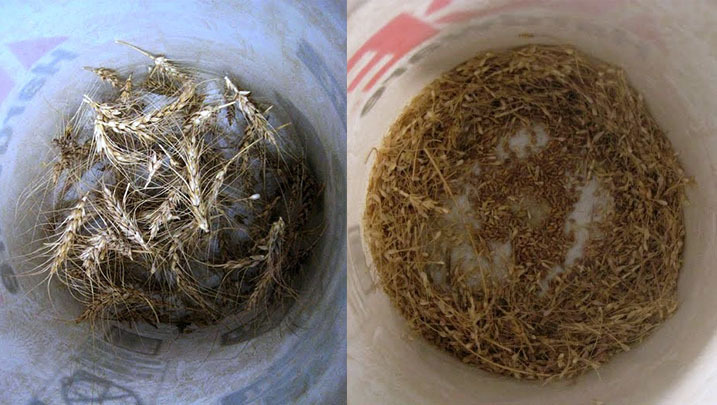 I use a hedge trimmer to cut the heads and a leaf sweeper to bring them back to my garage and a leaf blower on low and a cardboard box to winnow the chaff . Looks amazing! If you use hulled grain, does it remove hulls as well? Of course ya meant “diameter”, right?